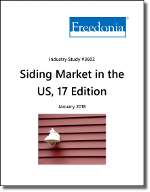 This study analyzes US demand for siding by material, market, and region. Siding is defined as exterior cladding for buildings. Excluded are such ancillary products as soffit and trim. The residential building market is further segmented by housing type (e.g., single-family, multifamily, and manufactured housing). The commercial building market is also broken out by building type (e.g., institutional, retail and lodging, office, industrial, and all other commercial buildings).